Don't hold your breath waiting for a sequel to LittleBigPlanet because the guys at Media Molecule say it's not going to happen. It is a natural tendency of the videogame industry to make sequels. The best-selling game of the holidays (yes, I'm calling it now) will be a sequel and the bulk of the most-talked-about games for 2010 are sequels, too. And although Activision's Bobby Kotick might be the only one to come right out and say it, you can bet that executives at most major publishers look at the likelihood of followups when they're considering a new title. Isn't it refreshing, then, when a company bucks the trend and says "no" to a sequel that would almost certainly have it swimming in cash? Such is the case with Media Molecule, the company behind LittleBigPlanet, which revealed in an interview with Critical Gamer that it has no plans for a new LBP. Why not? Because, according to level designer Danny Leaver, it would "fragment" the community. "We'd never want to do that," he said. "That'd be the most counterproductive thing you could do, I think." What Media Molecule does want to do is continue releasing updates and downloadable content for the game, adding to the ton of LittleBigPlanet DLC already available. 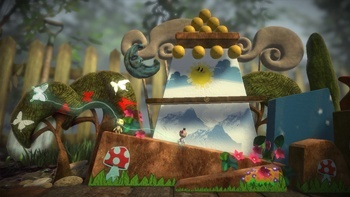 "I think what you've seen so far from LittleBigPlanet, that's the way it's going to continue," added producer Martin Lynagh. The comments vaguely echo the concerns expressed by the much-maligned Left 4 Dead 2 Boycott, which was launched in part over concerns that a Left 4 Dead sequel, released so soon after the original, would render the first game "obsolete" and cause a schism in the fanbase. Whether or not that actually happens, it's pretty cool to see a developer take a pass on a sure-fire sequel and opt to continue supporting its fans instead.